Undoubtedly, without question, you’d be insane to disagree, the pinnacle of Pokémon main games are Gold and Silver and their remakes Ho-oh is the “guardian of the skies”, Lugia is the “beast of the seas”. There is a sun in our sky due to the orbit of the Earth. The Moon affects tidal patterns with its gravitational pull and tidal changes happen significantly in large bodies of water such as seas. Look at the names of the Unseen Forces TCG English release theme decks if you don’t believe me: GoldenSky and SilveryOcean. It’s clear as night and day. Parallels are good. Nintendo has a history of trying to find homages and nods between related works. This is an auspicious start. This fantastic spinoff game had a really interesting world, concept, and design. The Fiore region was awesome, with sparsely populated towns and cities named after seasons, and protagonists named after, THAT’S RIGHT, the sun and moon. LUNICK. LUNA. I mean, how cool is that name? SOLANA. SOL. SUN. ALSO GREAT NAME. It’s a bit odd that a feminine noun like “la luna” and the masculine “el sol” were ascribed to the opposite genders, but you know what, that’s Pokémon for you. PROGRESSIVE. This is a really cool looking probably Steel-Fairy Artifical Pokémon. It’s a good start to Generation VII. So it’s pretty clear that whenever the Pokémon Company use night and day as inspiration, their mojo rises ten-thousand fold. 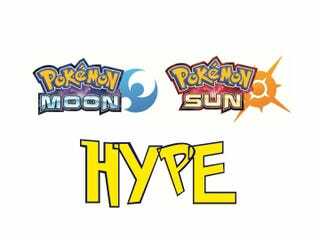 And these games are potentially NAMED after the sun and moon, so that’s like a 10 million combo bonus right there. Based off of the presented evidence, I am 100% convinced these new games will reach the zenith of Pokémon awesomeness. These games will be the very best, like no game ever was. Now to catch them will be my real test (of patience).